Bali is a paradise perfect for a romantic wedding–with its beautiful beaches, stunning rice paddies, and lovely villas at reasonable prices. 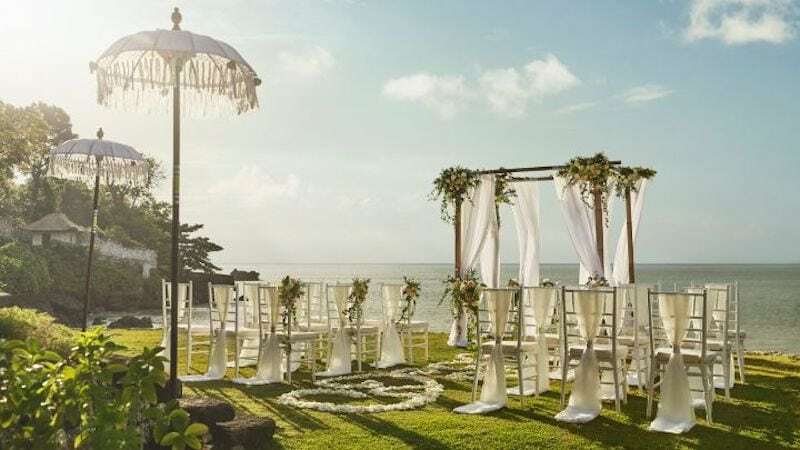 Given this, hosting a wedding in Bali is a popular idea, especially if the couple is willing to go the extra mile and prepare everything overseas: ceremony, reception, and party. Our tip? Research everything thoroughly before making a decision. With that said, here are the loveliest resorts and hotels in Bali you should add to your radar of wedding venues! This hotel is 70 meters above sea level, on the southern tip of Bali. It’s surrounded by white sand beaches, modern interior, and is near the famous Uluwatu Temple. It’s perfect for a laidback yet elegant wedding where everyone can enjoy each other’s company. 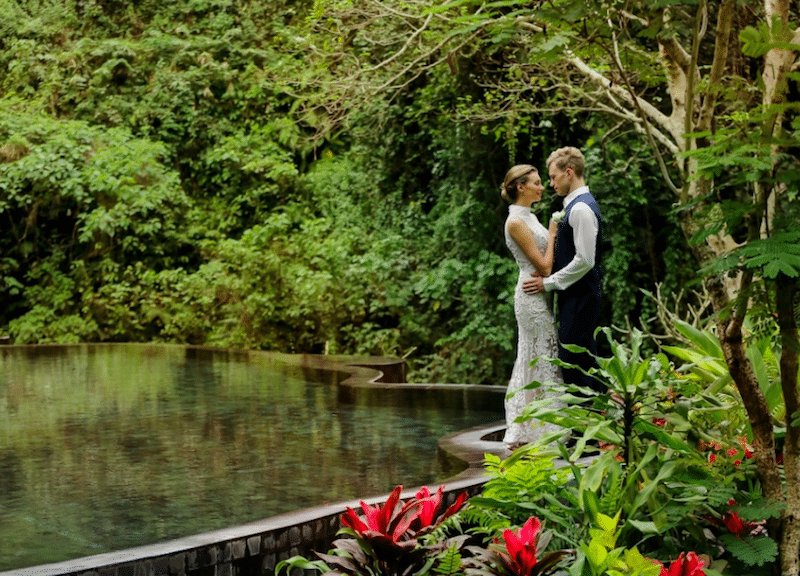 The Ayana Villa and Tresna Chapel found within the Ayana Resort & Spa grounds are both stunning locations for a wedding venue. The villa gives a panoramic view while the chapel is a pointed dome structure, both work well together and provide a view that’s unforgettable. 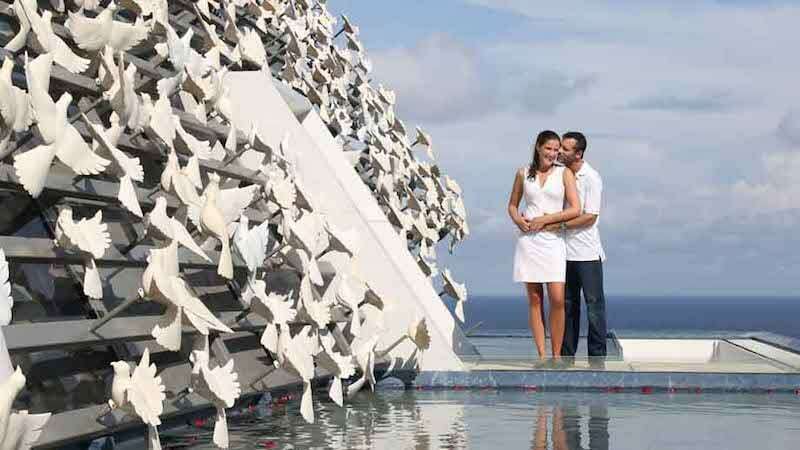 The Ayana itself has a roster of wedding locations, so you should definitely check it out. The Sheraton has a lush courtyard, a Bene rooftop, a Presidential Suite patio, and an elegant 700 sqm Sahid Ballroom ready to host weddings. They have different wedding packages that suite couples who want to experiment with floral and romantic themes. 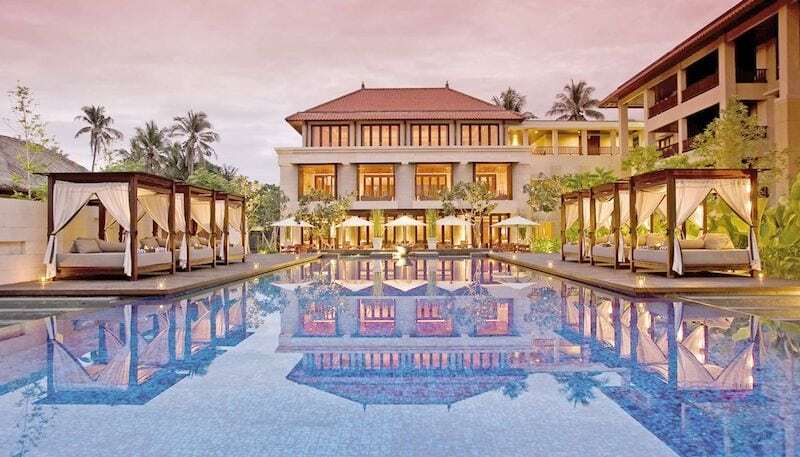 Anantara is a venue in Seminyak, Bali with rooms made up of local wood and classy glasswork. 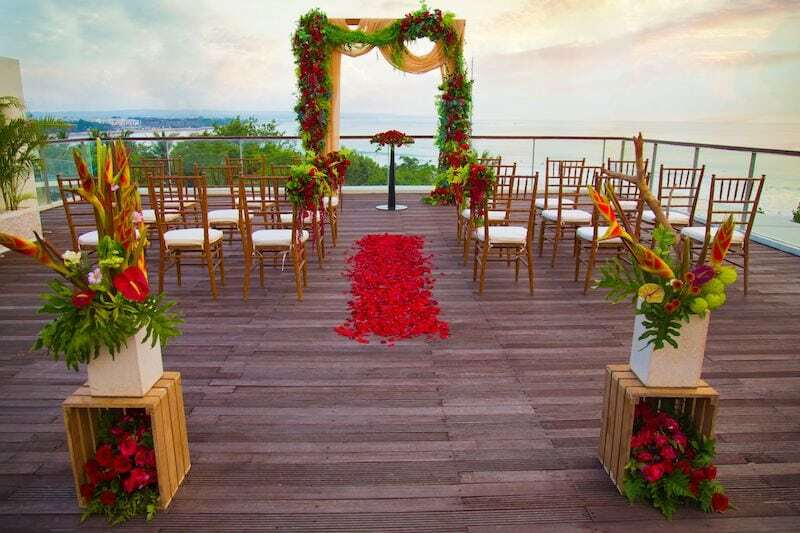 You can choose to either have a beach wedding or a wedding view on their penthouse. If you have an intimate wedding, this is a venue you should consider. This is another venue perfect for a small guest list. It has a garden area you can spruce up for different themes from island to rustic and even to an all-white. 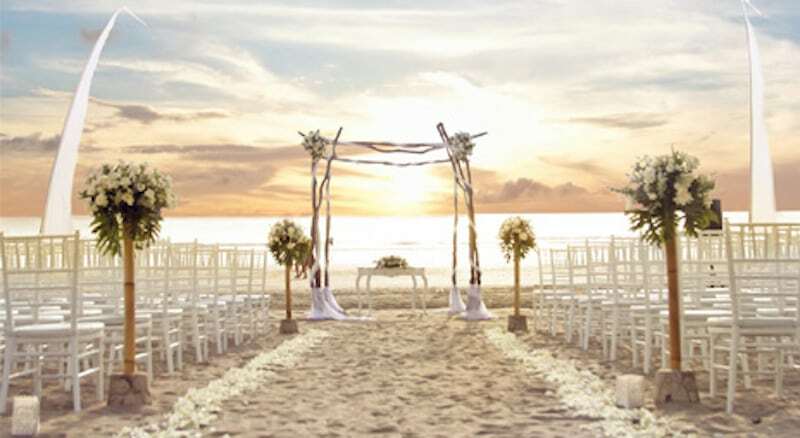 You’ll enjoy a wedding a stunning view of the Indian Ocean and the sunset. 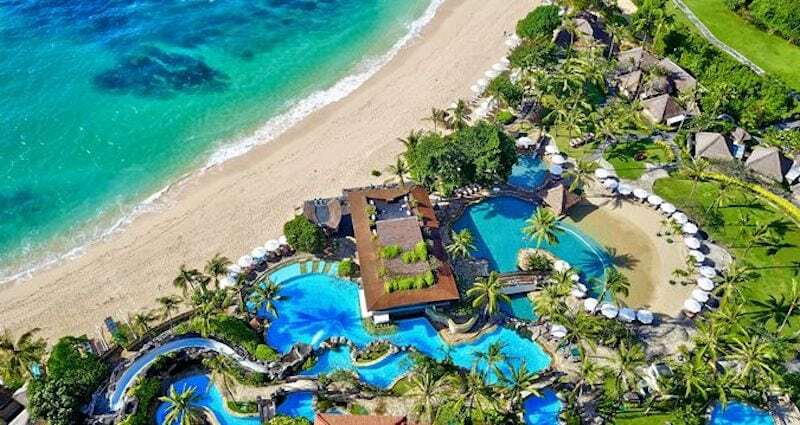 Nusa Dua is a favorite amongst Bali locals and tourist alike, so it’s a no-brainer to look at this island for beach wedding venues. The Conrad, in particular, holds 60 up to 300 guests and has a spectrum of luxurious interiors, food, and scenery to offer. 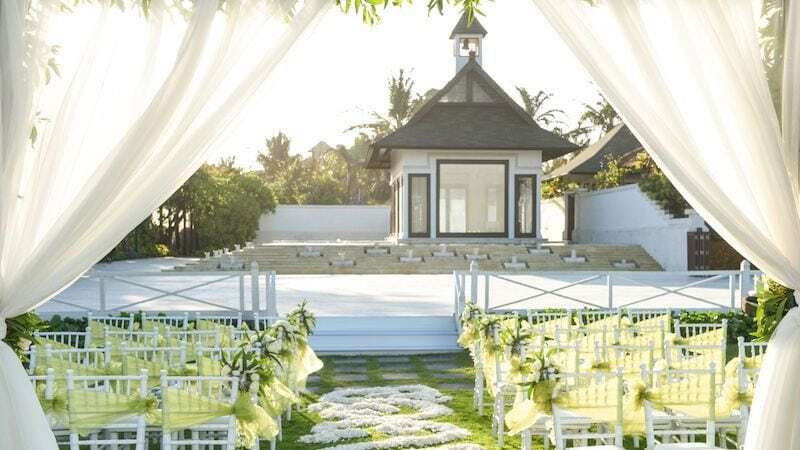 This is another venue you can add to your Nusa Dua wedding venue hunt. 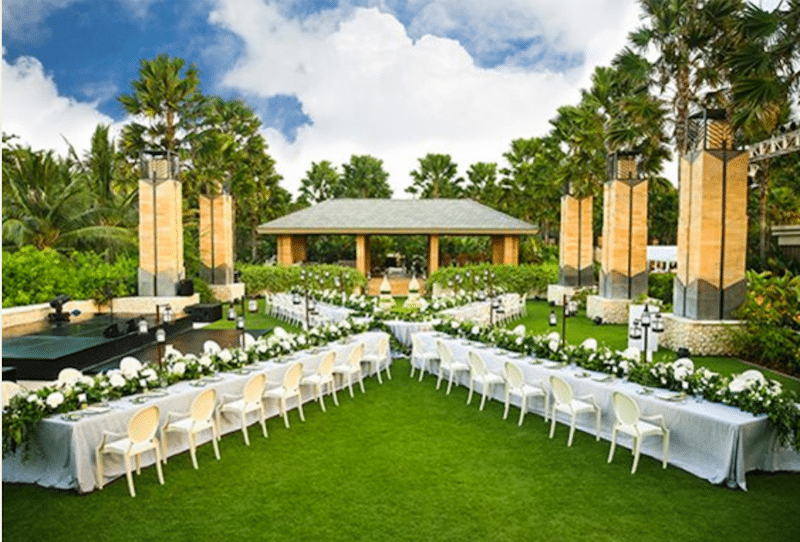 Claimed as Bali’s finest, they have indoor and outdoor venues you can customize according to the theme you have in mind. We personally think this one has the best view of the sunset! Maya is located in a secluded location smack in the middle of a natural environment in Ubud. The venue is the epitome of a modern paradise. If you want a lush unforgettable wedding, this is your pick. The Hilton has been known for their classic, Western approach but this one in Bali stands out for its island touch. The hotel hosts up to 200 guests. 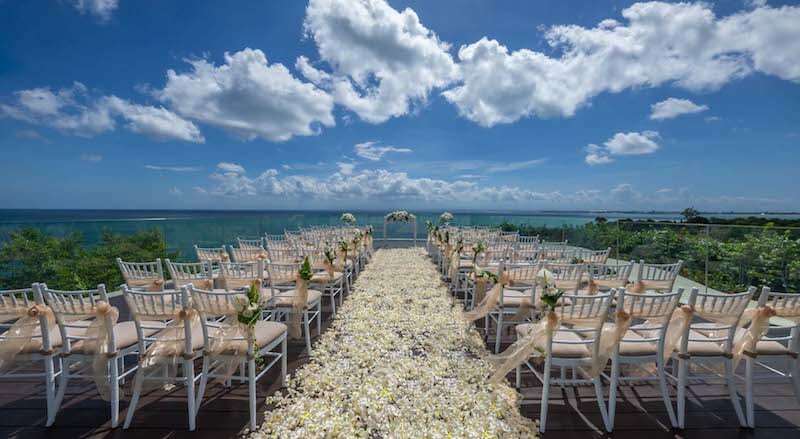 If you pick this venue, you’ll surely have a classic and romantic wedding. This is the only venue in the list that fits more than a thousand guests, thus this will be a perfect wedding if you plan to invite a large group of guests. The Mulia will make you feel like you have the whole island for yourself. Everything here breathes luxury, right from the lobby to the swimming pool area. It’s one of those venues that will be remembered forever–both by you and your guests! Whether you end up getting these venues or not, remember that the real purpose of a wedding is to celebrate love. Make sure you have that mind when you’re choosing your venue. Also, don’t forget that the venue should be able to provide you with only the best food, rooms, and a nice set-up!